What Are the Uses of Sports Wristbands? Tennis and sportswear legend Fred Perry invented the sweatband to absorb sweat from his hands and face while on the tennis court. Today, sport wristbands come in many shapes, sizes and materials. People have found uses beyond sopping up sweat. . The original terry cloth wristbands were designed to absorb sweat. Athletes -- most notably runners, tennis and basketball players -- still use wristbands to wipe sweat from their face and eyes. 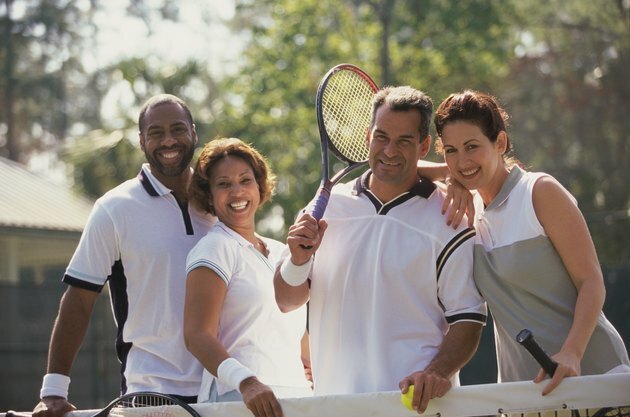 Tennis and basketball players reap the additional advantage of wristbands decreasing the sweatiness of their hands. It's rare to see a professional tennis player on the court without a wristband on his or her arm. Silicone wristbands have become synonymous with fundraising efforts and support of major causes. Bicyclist Lance Armstrong started this trend when he used Livestrong yellow wristbands to bring attention to cancer. The wristbands became a worldwide phenomenon and could be spotted on supporters around the globe. U.S. tennis player Andy Roddick uses blue wristbands with the words "No Compromise" to raise money for the Andy Roddick Foundation, which works to make a difference in the lives of at-risk children. The blue wristbands are popular within the tennis industry among fans and fellow players. Many other important causes use wristbands to help in fundraising efforts and awareness. Pink wristbands are used for breast cancer, red for AIDS, orange or green for leukemia and purple for lupus. Silicone wristbands have also made their way into the for-profit sector. Companies use them for advertising and promotion. The low cost of the wristbands means they are easy to order in large quantities and. Companies can afford to freely hand them out to employees and clients. The Promotion Advisor reports that people tend to wear and keep the wristbands long after the particular event has ended, keeping the company name in the public's eye. And wristbands are appropriate for all types of businesses. In addition to sports uses, schools, churches, entertainment and other organizations all employ wristbands to carry promotional messages. The Promotion Advisor: Should I Order Silicone Wristbands for My Next Promotion? Why Do Football Players Wear Bicep Bands?